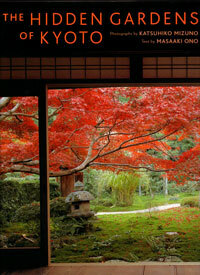 Kyoto gardens epitomize the austere yet visually potent elements of Japanese garden design. Mizuno's exquisite photography reveals the essential attributes of Japan's primary garden styles, offering breathtaking glimpses of private landscapes where refined textural effects are achieved in vast ponds surrounded by emerald evergreens, dry gravel waterfalls, and mossy expanses. Although the text accompanying each image is brief, Ono deftly explicates the consequence of a rock's placement or the calligraphic potency of raked stone, and clearly delineates the significant aspects of the pond, dry landscape, and tea garden. From the dynamic asymmetry governing a composition of shapely trees to the transitory response engendered by falling leaves, an ethereal perfection comes to pass in Mizuno and Ono's melding of words and pictures. Hardcover. 127 pages 9 1/4" x 12 1/4"